Inept Policeman Illegitimate Son of Inspector Clouseau! Son of the Pink Panther 1993 - 93 min. 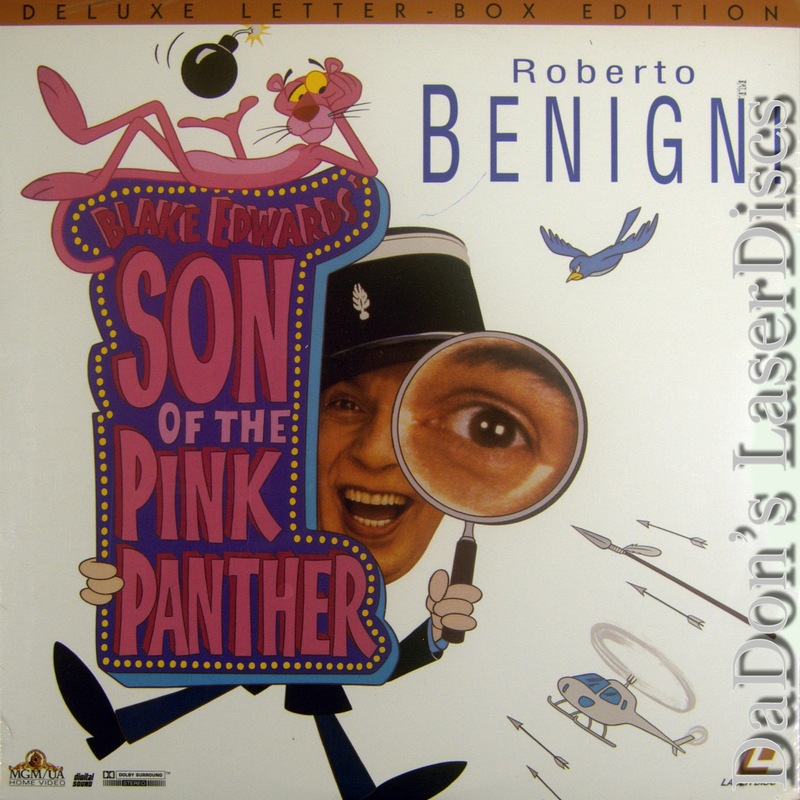 - Color Genre: Comedy Rated PG Country: USA LaserDisc Movie Storyline: The eighth and last entry in Blake Edwards's long-running series, SON OF THE PINK PANTHER stars Roberto Benigni (LIFE IS BEAUTIFUL) as the illegitimate son of the benighted Inspector Clouseau. Princess Yasmin, a member of the royal family of Lugash, is kidnapped while on vacation in France by terrorist Hans (Robert Davi), who demands a $100 million ransom, and Chief of Police Dreyfus (Herbert Lom) is called in to handle the case. Hans makes the mistake of being involved in a crash with Jacques Gambrelli, the bumbling illegitimate son of Clouseau, who manages to catch sight of the princess. Gambrelli also crashes into Dreyfus, who manifests his familiar Tourette's symptoms after meeting the son of the man who so often pushed him to the brink of insanity. After confirming his identity, the police chief sends Gambrelli on what he hopes will be a suicidal mission to find the princess in Lugash. Begnini is charming as the heir to the legacy of ineptitude. 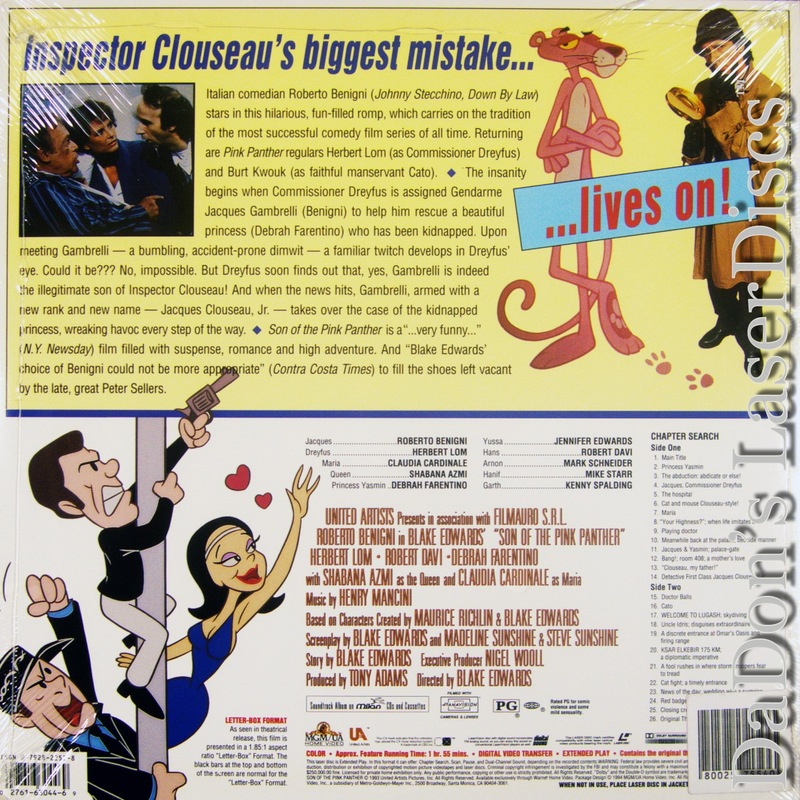 LaserDisc Movie Review: After the death of Peter Sellers in 1980, writer/director Blake Edwards assembled a new "Pink Panther" film from outtakes of Sellers as Inspector Clouseau from previous movies in the series (the result was called The Trail of the Pink Panther) and later made two attempts to revive the series with another actor. In this case, Edwards cast Roberto Benigni as Jacques Gambrelli, a hopelessly inept French policeman who turns out the be the illegitimate son of Inspector Clouseau. Gambrelli becomes involved with the investigation of a kidnapping involving the beautiful Princess Yasmin (Debrah Farentino) literally by accident, when he crashes into a car driven by Police Commissioner Dreyfus (Herbert Lom). Gambrelli soon becomes smitten with Yasmin, while the investigation suggests that the kidnapping was set up by her mother, the Queen (Shabana Azmi), and her lover, General Jaffar (Aharon Ipale). Claudia Cardinale who played a different character in the original Pink Panther returns, while Burt Kwouk returns as the violent Korean manservant Cato. Roberto Benigni's Gambrelli proved no more successful at the box office than Ted Wass's Clouseau-like Clifton Sleigh in The Curse of the Pink Panther (1983), though after his multiple-Oscar winning success with 1998's La Vita e Bella, Roberto's probably gotten over it. --- Mark Deming Thanks for Visiting DaDon's Rare LaserDiscs ! Reviews, Articles, Newsletter and Information for Movies on LaserDisc LD Laser Disc, LazerDisc.